If you’re looking to build your home gym a weight bench is often one of the first things you think of, especially if you’re wanting to incorporate some weight lifting. This York B530 bench review looks at one of the more popular fitness benches around at the moment. I’m a big fan of this weight bench for a few reasons – being from a reputable brand I know that it will work well and be up to the job. This is so important when working with weights and something that is often overlooked especially when starting out. Get a good brand! These are heavy weights and you don’t want to risk your health by using sub standard equipment! Ok, with that out of the way, the next thing that I like is that this is still a good value piece of equipment. It’s a good budget weight bench, not out of reach of many people starting out. There are areas where it could be improved, I’d like to see a better lateral tower attachment that could take better weight but other than that it does what you want it to do. You can do all sorts with this bench from bench presses to leg curls and of course with the attachments that also helps to increase your repertoire. One of the main attractions for me with this weight bench is the fact that it is from a reputable maker – York is a big brand in the UK for fitness equipment – and also that it’s suitable as a heavy duty bench. If you have any hopes to use this bench to do any kind of heavy weight lifting then you need a good, strong and sturdy bench underneath you. The B530 has a maximum load of 200kg – obviously that includes your own weight but it still gives a good amount that you can load up on your barbells too. It possibly won’t be suitable for serious bodybuilders but for the majority of weightlifters it’s more than adequate. 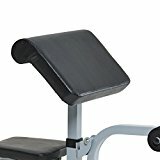 This arm curl pad fits at the end of the weight bench and can help with your bicep work. If you do curls either with the bar bell or with individual dumbbells this will help keep your form good and avoid injury. It’s a great addition to a work out bench in my opinion as most people who are working with weights will be doing plenty of bicep curls and this really ensures you isolate and really work the muscle. Used for lateral pull downs, this lateral tower attachment is a really useful addition to the bench. It has a maximum weight of 40kg to be used on it, which seems a little lightweight in my opinion but should be fine for many people although if like me you want to increase over time you might find that you grow out of it. As well as these attachments there’s also lots of weight bars, weight plates and curl bars that can be bought and you can be sure that they’ll all fit and work together well. 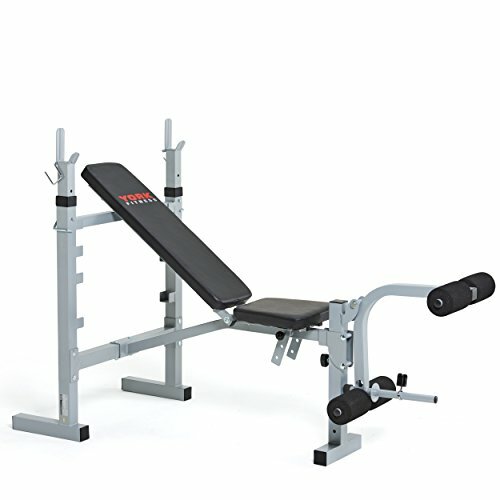 If you’re looking for a good value but also good quality weight bench then this is probably the best one that you can get that fits both requirements. It’s heavy duty and can grow with you as you increase the weights you’ll use and if we ask ourselves honestly, we’re planning to increase what we lift aren’t we? Best to get something that will work for all we want then!